While the gateway and networking initiatives described in this book build on expanding the reach of the Internet through traditional and geographically defined communities, the configuration and location of communities is also changing, creating new needs and opportunities. Radio and the Internet are playing a role here, as well. With an estimated 75 million short and medium term international migrant workers and their dependants in the world today, international migration is both a consequence and a driving force of globalization. Most of these workers retain, or would like to retain close ties with families and communities in their countries of origin. These ties, enhanced and supported by the use of ICTs, make a significant contribution to development in a number of important ways. The two chapters in this section show how the radio/Internet combination is enabling migrants to connect with their home communities to the benefit of both. In rural areas, where there are no telephones, broadcast radio is often used to deliver personal messages between community members. People listen to the radio not only to hear news and music, but also because it is a community bulletin board and an electronic post office, where they can pick up what José Ramos and Ángel Díez call airwave mail. Blending Old and New Technologies: Mexico's indigenous radio service messages, looks at how this service is being enhanced and extended by the Internet, allowing people to receive broadcast messages from friends and families thousands of kilometres away. Callos and Guatitas: Radio and Migration in Ecuador and Spain, by Luís Dávila and José Manuel López, describes a situation in which radio and ICTs are being used to connect Ecuadorian migrants in Spain with their home communities. The chapter demonstrates that the connection means much more than keeping families in touch, since in the year 2000 Ecuadorians living abroad sent almost US$1.5 billion to their friends and relatives back home-making them the country's second-largest source of foreign income. From Chicago, USA, Luis Ramírez sends this message for his brother Arnulfo, in San Juan Puerto Montaña. Luis has the money for the musicians and wants Arnulfo to go to the phone booth in Metlatonoc in the morning of Friday, the eleventh. Luis will call then to get the number of the bank account where the money should be deposited. Messages like this are common on the radios of the Sistema de Radiodifusoras Culturales Indigenistas (Indigenous Cultural Radio Network). They are an illustration of the communication services these radios have provided for the indigenous population in their broadcast areas since their inception more than twenty years ago. Even now this airwave mail is extensively used in many rural areas of the world because it is the only available form of telecommunication. Despite its simplicity, the service is very important to the community and it is offered by community, cultural, and commercial radios alike. These messages reveal how indigenous peoples have imaginatively adapted the old technologies of radio and the telephone to meet their everyday communication needs and contribute in very practical and concrete way to local economic development, health, good governance, and, as with the message above, cultural heritage and the maintenance of a system in which community members help pay for the community's traditional and religious festivities, even when they are not able to be present. The messages are often broadcast into local languages, which means that they are important in terms not only of their usefulness to the population, but also of their contribution to strengthening the language and culture of the communities. If we consider the spatial dimension of this communication, we can see that this technological convergence of radio and the telephone, has made it possible for the message service to play both an intraregional role, by establishing communication among the villages of the broadcasting area, and an extraregional role, by linking migrants with their native communities. It is also interesting to note that this convergence happened years ago in a practically spontaneous way, as soon as the telephone became available. It was not a donor driven project but rather a response to a technological possibility that presented itself and that fulfilled concrete needs and demands of the population. Now the Internet is appearing in some indigenous stations in the same way the telephone did less than fifteen years ago, and it is being embraced in the same spontaneous way. The Internet, telephone and radio are being combined to extend communication possibilities and enable communities to keep in touch, despite migration and other factors that threaten the social fabric and economic possibilities of the communities. Almost all of the twenty radio stations belonging to the network are connected to the Internet, although in some cases it is slow and expensive, requiring long-distance calls over bad quality telephone lines. However, Mexico's current public policies include an ambitious project to extend Internet connections to poor and isolated communities throughout the country by installing centres equipped with computer equipment and other technology, such as satellite TV, in the country's poorest communities and regions. These centres, called plazas comunitarias (community squares), are intended to broaden access to education, fight backwardness, and help to reduce the so-called digital divide. Current plans involve establishing 500 such centres in 2002 and to have 20 000 of them in place by 2007. This chapter will examine the message service provided by indigenous radio stations and the convergence of conventional technologies that it involves. We will then go on to look at some emerging opportunities and challenges presented by the increasing availability of the Internet in indigenous communities. The first part of the chapter presents a brief overview of the indigenous peoples of Mexico and of the characteristics of the indigenous radio network. That is followed by a description of the radio message service and some research findings on this subject. The document ends with some thoughts on the adoption of new communications technologies and the opportunities that they can offer for intercommunication among indigenous peoples. Mexico's multicultural make-up, a reality that is recognized in the country's constitution, is primarily a result of the presence of its indigenous peoples. Estimates vary considerably but even the most conservative estimates are that ten percent of the country's population is indigenous - twelve million indigenous people belonging to nearly sixty ethnic groups with diverse languages and cultures. Historically, Mexico's indigenous peoples have lived in extreme poverty and marginalization and have suffered from the country's highest levels of infant mortality, malnutrition, illiteracy, etc. Many indigenous communities are located in extremely remote areas and almost 90 percent of municipalities with primarily indigenous populations are classified as poor or extremely poor. In summary, the current situation of Mexico's indigenous peoples reveals inequity in the distribution of wealth and public services as well as the ethnic and linguistic discrimination that they have endured for centuries. Emigration is a major factor in the social framework of indigenous regions, with large numbers of indigenous people swelling the poverty belts in cities, moving temporarily to farming areas in other regions of the country, or illegally crossing the border into the USA. Although it is impossible to obtain precise data on how many indigenous people emigrate temporarily or permanently, this growing trend obviously entails significant cultural disintegration. With the appearance of the EZLN almost eight years ago, the indigenous movement has become stronger, and its organizations have broadened and developed. Although recent constitutional amendments have not fully satisfied the demands of indigenous peoples, they have presented some interesting opportunities for greater participation of their communities and organizations in the design of development policies. Building a positive ethnicity as a means for struggle and survival is seen as a fundamental strategy by the contemporary indigenous movement. The Instituto Nacional Indigenista (INI) is a Mexican governmental organization that works specifically with the country's indigenous groups. It operates the Indigenous Cultural Radio Network, made up of twenty AM stations with broadcast ranges between 50 and 120 kilometres. The programming of this network targets five million people belonging to 30 distinct ethnic groups. The network also includes four low-power FM stations run by indigenous schoolchildren in the Maya Peninsula. INI's radio network is unique in the world because of its governmental nature, the number of stations that it includes, and the cultural and linguistic diversity of its audiences. Since the end of the 1970s, when its first station was set up, the network has grown continually and become one of the focal points for the state's actions on the indigenous front. Radio generally has strong roots among indigenous communities, who appreciate and use the stations. While at times they are questioned because of their ties with the government, the radio stations in the network have shown that their regional presence is an essential part of the cultural scene, and they are a highly-valued information and communication tool. 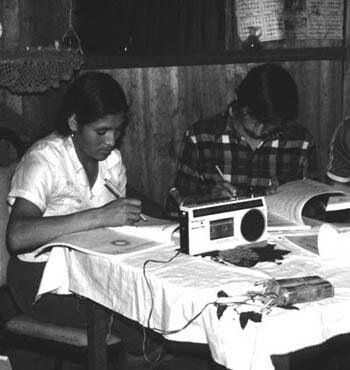 Although the objectives and strategies of this radio broadcasting system have changed over the years, reflecting in part changing State policies concerning indigenous peoples, and although each new experience has been accompanied by its own concrete changes, strengthening indigenous cultures has been a constant concern of INI's radio stations, illustrated by the use of Native languages on a footing at least equal to that of Spanish, broadcasting time devoted to indigenous cultural expressions, and the free-of-charge broadcasting of messages. INI's radio stations have set aside daily programming time to broadcast, free-of-charge, avisos or messages submitted by individuals, organizations, and institutions. These messages deal with a broad spectrum of subjects and originate from and are intended for very diverse audiences. What they have in common, however, is that they respond to explicit needs for information and communication as formulated by the service's users. Research has shown that the users consider the service to be very useful. For example, in a study conducted in the Mixteco area of Oaxaca, 20 percent of respondents said that the messages were their favourite part of the radio station's programming. Only music, preferred by 29 percent of respondents, was more popular. The radio-announcement programmes are usually presented two or three times a day, and their duration varies according to the number of announcements. For stations located in mountainous areas, where roads and telephone lines are seriously lacking, the messages may be the only available means of communication for people living in scattered and isolated communities. Where geography and climate have made it easier to establish communication lines and where all villages are accessible, the situation is very different. A study conducted in 1995 describes how in radio stations such as XEPUR, in Cherán, Michoacán, or XEPET, in Peto, Yucatán, both located in regions with fairly good road systems, the message service is minimal. In areas such as Montaña de Guerrero or Sierra Tarahumara, however, the demand is much greater. Whatever the level of demand, in addition to being of immediate use for practical matters, the messages seem to have strengthened social cohesion within communities and regions. People make use of the station as a means of communicating within social networks and even a way of maintaining the networks themselves. Messages also keep community members informed of events and activities involving other people in the community when, for example, messages intended for a neighbour or relative are overheard by others. ... indirectly and perhaps unintentionally led to a strengthening of regional social cohesion through new forms [of communication]. In other words, the opportunity for the residents of La Montaña to maintain interregional communication... has enabled them to continue circulating information on events and situations that are part of people's daily lives. By placing regional daily affairs on the public airwaves, the messages constantly remind listeners that their environment extends beyond the boundaries of their local community and neighbouring villages. The messages serve not only as a means of communication between two people but are also used frequently to send messages to specific groups or entire communities. Messages originate from groups of people as well. If we look at the messages that announce meetings for example, it is interesting to see that many are from municipal councils in coordination with local schools - invitations to community celebrations where traditional music is played and cultural identity is recreated and reaffirmed. These invitations are one way that radio is capable of supporting traditional forms of community organization based on a feelings of identity and of belonging. This service began as an intraregional communications alternative, but it has gradually become an extraregional means of communication as well, with a large number of messages requested from other regions of Mexico and from the USA. Messages are delivered to the radio stations by mail, telephone, third parties, and now the Internet. They include simple greetings, information about money transfers, and emergency alerts. The messages inform people who remain in the region about relatives who have left, and, for temporary or permanent emigrants, they are a means to keep in touch with their place of origin. In other words, given the significance of the migratory phenomenon, the messages have become an important tool for keeping culture alive outside its geographical boundaries. Before the 1990s, when telephone lines were installed in remote small towns, people requested announcements only in writing or in person. Some would go directly to the radio station, and others would send someone else with their requests. Eventually letters began to arrive from other regions of Mexico and from the U.S. with requests for messages. However, since the appearance of mobile phones in rural areas, an increasing number of messages are phoned in to the stations. Access to the telephone has had an impact not only on how messages are sent but also on their content. In research conducted recently in one region, it was found that the most frequent requests were for someone to receive a telephone call (22.9 percent); to go somewhere (12.7 percent); and to make a telephone call (8.2 percent). The study also highlighted the importance of the extraregional communication flow with 36.4 percent of personal messages originating in other Mexican states or in the USA. As mentioned at the beginning of this paper, there is a gradual increase in the number of message requests received via the Internet. While the message that began this chapter was received by telephone, similar messages are beginning to arrive via email. As the service develops, it will undoubtedly become common for stations to receive emails asking that messages referring to telephone calls be read over the radio. This convergence of three means of communication and information will facilitate and strengthen the existing intercommunication between the radio stations and between indigenous communities and individuals in various parts of Mexico, in the USA, and elsewhere, providing support both for local communities and migrant workers. According to all indications, the trend will intensify over the coming years. On the one hand, the government's plazas comunitarias will soon be appearing in a number of indigenous regions. On the other hand, in the framework of this project, some of these plazas have already been installed in the USA for use by Mexican immigrants. Furthermore, indigenous migrants settled in cities have begun to form independent organizations and some of these, aware of the potential that new technologies can offer, have begun to use them to their own advantage. One example of this is the Asociación de Mixtecos en el Distrito Federal (Association of Mixtecos in the federal district of Mexico City), which exchanges information and keeps in contact with the radio station that broadcasts in the Mixteco area. There is, of course, some substance to the argument that indigenous migrants do not have easy access to the Internet, given their low education levels and poor living standards. However, it should also be recognized that migrants are not necessarily the least educated or most impoverished. On the contrary, migration has been most intense in those sectors of the population that have had the best opportunities. While there is truth to the claim that simply making technology more available will not serve to bridge the digital divide, it is also true that we should not underestimate the abilities of indigenous organizations or their growing demand for opportunities and access to means of communication. The message services and email are obviously not the only ways to make use of an Internet connection. There are other means of making relevant use of the Internet in combination with radio stations. Consider, for example, the development of portals for marketing products, distance learning and education, the exchange of information and programmes among radio stations, or on-line consultation regarding health or agricultural techniques for sustainable development. However, meeting basic information and communication needs with this kind of messages continues to be a major imperative for supporting indigenous people's free and autonomous development. We therefore believe that it is essential to pay attention to the need for greater access to technology and to provide some direction and intentionality in the way that it is used. This means that the INI radio stations should be ready for the arrival and expansion of the Internet so that they can include it in their strategies and work plans, thereby increasing and improving the services they offer. Emilio, with us we have a woman who has come back from Spain to authenticate her documents, and she'd like to ask you a question. Yes, I came back from Spain one month ago to see how the authentication of my documents was going. At the Spanish embassy here in Quito they told me that the embassy has nothing to do with that process and that coming back here was useless. What can I do now? Before going back to Ecuador, you should have visited the Labour Ministry here in Madrid. But I didn't know that, and here I am. So what can I do now? Every week radio creates a bridge joining Ecuadorian immigrants in Spain, their relatives in Ecuador, legal advisors, and radio announcers on both sides of the ocean. The scripts change but the main subject, migration, remains the same. Spain has become one of the most attractive countries for the huge numbers of people who left Ecuador in search of a better life following that country's 1996 socio-economic crisis. Migration has always been a part of life for Ecuadorians, particularly for those from the country's southern region. Most Ecuadorians probably have at least one relative living in the United States, but in the last few years the number of people leaving the country has increased five-fold, causing the term migration to be replaced by that of exodus. So far there are no indications that the upward trend is going to level off. There is more at the root of this situation than the worsening economic crisis; in reality, people have even lost hope in the future. A rapid succession of heads of state between 1996 and 2000, a lack of confidence in its institutions (especially its Congress), the bankruptcy of the country's financial system, as well as the everyday difficulties inherent to a foreign-debt-ridden state unable on several occasions to pay the salaries of civil servants, have all not only aggravated the economic crisis but also created a crisis in terms of social expectations, turning the traditional migratory stream into a flood. Paradoxically, the economic reality is such that the migration resulting from the crisis is also the main component of its solution. According to data from Ecuador's Central Bank, in the year 2000 Ecuadorians abroad sent a total of US$1,316 000 000 to their friends and relatives back home, making these payments the second-largest source of foreign income, surpassed only by oil exports. Traditional export products such as bananas, shrimp, and cocoa remain far behind. Given the increasingly restrictive measures concerning entrance into the USA, migrants have diversified their destinations. In the last few years Spain has become one of the most significant destinations for Ecuadorian migrants. Data on foreign residents in Spain show that the presence of Ecuadorians in Spain was negligible between 1955 and 1980. In all of Spain there were approximately 125 listed in 1960; less than 500 in 1970; and just under 600 in 1980. But the number of Ecuadorian foreign residents began to grow significantly in 1996, with annual increases higher than 40 percent for both 1996 and 1997. Since then, Ecuadorian immigration has continued to rise at a dramatic rate: 70 percent for 1998, 84 percent in 1999, and 123 percent in 2000. In 1996 there were only 2,900 Ecuadorian residents in Spain, but by 2000 Spain's Ministry of the Interior reported 30,878 Ecuadorian residents. If we add to that figure the 22,954 Ecuadorians who applied for legalization of their immigration status during 2000, the total, according to official statistics, rises above 50 000 people. Studies conducted by NGOs, however, have produced different data. Extra-official estimates are that as many as 200 000 Ecuadorians have entered Spain. Most of them in extremely precarious situations - with no legal status, and an accompanying series of problems such as misinformation, fear, and uncertain working conditions. The arrival in Spain of large numbers of Ecuadorians was both rapid and silent. Most Spaniards became aware of the Ecuadorian situation only in February 2000, following the tragic events in the locality of Lorca, province of Murcia, where a small truck full of illegal Ecuadorian immigrants on their way to do farm labour was hit by a train. Several were killed, and Ecuadorians suddenly and tragically became visible in Spanish society. Because of its size, this migratory wave has had significant social and economic repercussions, both for those who remain in the country and those who migrated. From the social perspective, thousands of Ecuadorian families have been torn apart, resulting in a situation has produced new kinds of relationships and exchanges. Although this situation has caused many people to suffer, it has also generated some positive change in both societies. On the economic level, for example, many families now rely on the money that arrive from Spain. Furthermore, new houses are springing up in the home towns of emigrants who have already begun to use their savings to prepare for retirement. The new situation can be interpreted in different ways, but for many organisations and individuals involved, the starting point was that migration is not a problem but rather a process with both negative and positive components. It is a reality that is best treated as an opportunity. With this in mind, four Ecuadorian and three Spanish institutions have implemented a joint programme named Migration, Communication, and Development. The four Ecuadorian institutions that took part in the program's design are the Asociación Latinoamericana de Educación Radiofónica (ALER, Latin American Radio Education Association), the Fondo Ecuatoriano Populorum Progressio (FEPP, Ecuadorian Populorum Progressio Fund), the Comisión Ecuatoriana de Pastoral Social (CEPAS, Ecuadorian Social Pastoral Commission), and the Instituto Latinoamericano de Investigaciones Sociales (ILDIS, Latin American Social Research Institute). The three Spanish institutions are the Coordinadora de Radios Comunitarias (CRC, Community Radio Coordinating Council), Cáritas Española, and the Campaña Deuda Externa ¿Deuda Eterna? (Foreign Debt - Forever Debt? Campaign). The objective of the programme is to turn Ecuadorian migration into a positive element for cultural exchange and the development of Ecuador and Spain. All seven organisations have arrived at a similar analysis of the migrational phenomenon. They consider it to be a continual coming-and-going process through which the situation of Ecuadorians in Spain and the resources that they obtain there produce significant results in their native country. They therefore approach this situation from the perspective of an engulfing globalisation in which migration is but one component. The programme is not designed to convince people that they should or should not emigrate or that they should return to Ecuador, but rather to provide conditions that will enable emigrants and potential emigrants to make their own choices about leaving, returning, bringing their families back together, investing in Ecuador, and so forth. The programme will continue for five years, but this time frame will be reviewed in light of the results obtained and migratory trends. This work is being conducted in six areas: communication, rights counselling and education, development projects, financial and ethical money transfers, debt for development, and research. This area of the programme is designed to establish contacts between immigrants in Spain and their relatives in Ecuador, to deal with migration-related legal matters, to address the migratory issue from other perspectives, and to make it more visible. In this framework, a weekly radio programme linking Spain and Ecuador is produced on the airwaves. The next step will be to set up Internet teleconference rooms in various Spanish and Ecuadorian towns and provinces so that communication will be easier and more efficient. Further in this chapter, following the description of the other areas of the program, we will return for a more in-depth look at this area. One of the basic needs of migrants is information on their rights, particularly in terms of their legal status and social security benefits. Most of the activities in this area are designed to disseminate information, although issues such as psychological support for migrants' relatives remaining in Ecuador are also addressed. A manual has been published so that immigrants in Spain will know what their rights are, how and when to proceed with paperwork, and where to go for help and counselling. There is also coordination among various organisations in an effort to find solutions to particularly difficult cases. Work in this area is being carried out primarily in Ecuador, where attempts are made to involve the families of emigrants. The intention is to promote and support the productive investment of the funds being received in Ecuador, which historically is often used for luxuries, such as the construction of mansions or the purchase of automobiles, instead of productive economic initiatives. If emigrants so wish, they can consider the possibility of returning to Ecuador with some guarantee for the future by, for example, investing in a young company. A total of US$270 000 will be available annually over a four-year period to provide technical support for such initiatives in the south of Ecuador. Another major problem is related to how money is sent from Spain to Ecuador. Some of companies that offer this service have been known to charge commissions of up to 14 percent to wire money from Spain to Ecuador. This part of the project seeks to help emigrants send money more easily and at a lower cost. One of the activities involves working with several Spanish banks so that money may be sent to Ecuador via Codesarrollo, the financial agency run by FEPP. The radio programme also plays a role in this area by announcing the rates charged by the various money transfer companies, which currently range from 3.7 to 14 percent. Productive employment projects could be financed in part through debt-for-development initiatives in which part of Ecuador's debt to Spain is forgiven on the condition that the money be matched with investments from Ecuadorians living in Spain and invested in business and development activities in Ecuador. A technical proposal is being developed that would see a portion of Ecuador's US$200 million debt put into this fund. Joint research is being conducted in Ecuador and Spain. So far we have an overall approximate idea of the situation of Ecuadorians in Spain. One important finding of the research was that there are now 200 000 Ecuadorian immigrants in Spain. This figure, much higher than previous estimates, is now used by both the Spanish and Ecuadorian governments in planning their programmes and services. Another study looked at the reasons why so many Ecuadorians have left their country and a third at the remittance phenomenon. The latter study uncovered a great deal of information about the money transfer market and the abuse committed by the companies involved. The package of activities described above was designed to address a wide spectrum of social, legal, ethical and financial questions. How could potential migrants get better information before they left Ecuador? What measures could be taken to give migrants the confidence required so they would invest in Ecuador? How could the issue of organized crime be addressed? It was obvious to the agencies involved that communication would be key if these issues were to be addressed. Callos y Guatitas, a live radio programme broadcast simultaneously in Ecuador and Spain, was selected as the primary communication tool to bridge the realities of Ecuador and Spain, to connect families, and to provide information to help migrants fend for themselves throughout the entire migration process. The program's name comes from a dish made of tripe that is popular in both countries and referred to as callos in Spain and guatitas in Ecuador. To understand the importance of this program, we need to be familiar with the misinformation that circulates on both sides of the ocean, fomenting the development of organized crime and the abuse that many migrants and their families have experienced. On the one hand, many Ecuadorians believe that it is easy to find a job in Spain. Some have even been convinced that at Madrid's Barajas Airport there are windows where job contracts are signed. Nothing could be further from the truth for those who have just arrived in Spain. Such misinformation is promoted by coyotes and criminals, whose income comes from the huge sums of money that emigrants have to pay before they can embark on their adventures. On the other hand, the life of an Ecuadorian in Spain is not a valley of tears, nor is racism as significant a component of Spanish society as those opposed to migration would have us believe. to offer an overview of the situation and to disseminate information on the different opportunities available to migrants via the Migration, Communication, and Development Program. 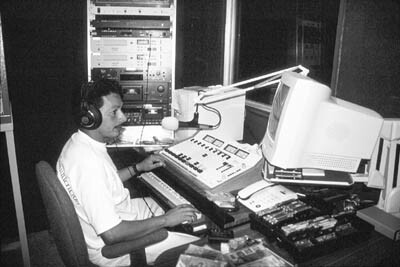 Callos y Guatitas has been on the air every Sunday since 22 April 2001. It is produced by the Asociación Latinoamericana de Educación Radiofónica (ALER) and the Coordinadora de Radios Comunitarias de España. At present it is broadcast simultaneously via the ALER satellite service on 19 stations in Ecuador as well as on four in Madrid. There is currently an effort under way in Spain to increase the number of stations included in this broadcast. The programme is produced simultaneously in Ecuador and Spain. Its two hosts, one in Madrid and the other in Quito, direct the programme and present the various sections coming from each country. The first problem was to decide on a broadcasting time. Depending on the time of year, the time difference between the two countries is six or seven hours. In an attempt to reach targeted listeners in both countries, we finally settled on Sunday at 10:00 in Quito, when it is 17:00 in Madrid. At 10:00, many rural Ecuadorians are at the marketplace, where they can walk around and still follow the programme on one radio receiver after another. It is also a good time for Ecuador's city dwellers. At 17:00 in Spain, immigrants may be at home or may have gone to a common meeting place where the radio is often turned on. The time difference means that good morning is answered with good afternoon, and vice-versa, and that there are always two versions whenever the time is announced. The programme is divided into segments. So that's the way it works provides information on the immigrant situation in Spain, especially on political or administrative changes and on new social resources. What's happening at home? is a summary of Ecuador's weekly news for the benefit of Ecuadorians in Spain. The Cause of the Cause offers special reports on specific issues related to migration. We're organising over here, too turns the program's airwaves over to immigrant organisations. Just ask allows migrants and their relatives to ask questions on legal matters. Sometimes these questions are received by telephone, but usually by e-mail. Hello, who's speaking? is a section that enables immigrants in Spain to speak directly with their relatives in Ecuador. The family members are usually present in the studios of the radio stations, and this allows for more fluid communication in which the radio hosts can also take part. In addition to the segments described above, the programme also includes more general subjects that may vary in accordance with current events. An example of this was a Mother's Day extension of the Hello, who's speaking? section in which many sons and daughters were able to send live Mother's Day greetings and even sing songs. One of the challenges faced by the program's organizers has been to design it to be useful to stations with limited financial resources that do not have access to expensive technology. Various broadcast methods are now being used. In Ecuador, ALER's satellite network (ALRED) sends a signal from its Quito station to the satellite, and the other stations receive it by means of their dish antennas. The Spanish stations use the ConVoz information network, which produces a daily information programme for many Spanish community and municipal stations and is located in the same building as the studio where the programme is produced in Madrid. The stations have a telephone connection to a server through an ISDN line. The WinMedia program compresses the signal at the server end and then decompresses it in the computer of each radio station. This system provides very high quality audio and the only drawback being a seven-second delay. Given that it requires only a small investment and that the software free, this system is very efficient. Callos y Guatitas can also be listened to live on the Internet on the Web pages of two Spanish stations: Radio Vallekas and Radio Enlace. This means of listening to the programme is available to some immigrants in Spain who live outside Madrid and who cannot tune in to it on the radio. The Callos y Guatitas programme has just ended what might be termed its implementation phase. Some initial technical and production difficulties have been overcome; the broadcast network has been established in Ecuador and is becoming established in Spain; and new areas have opened up. An example of the latter is the use of the Internet. Although it was not originally foreseen, it may become an important factor in disseminating the program, particularly to immigrants in Spain. The Communication, Migration, and Development Program is, above all, a means to address situations that the new world reality has placed in our path. The program's contribution should be seen much more in terms of quality, not quantity, given the limited financial resources of the organisations that are promoting it. The objective of the program, first and foremost, is to offer a general overview of migration by providing immigrants and society with positive ideas for making the most of the immigration process and by encouraging development in both Ecuador and Spain. The programme is therefore actively seeking partnerships with other organisations with a similar vision and activities in both countries. It is not, therefore, the sum of its activities but rather a means to coordinate these activities and the synergy produced by them. From the above it is easy to understand why, at this time, the first task is simply to make the work and the potential known, to help people understand the reality of migration and the keys to addressing this issue, and to ensure that there is a connection between migrants and their families and between Ecuadorian and Spanish society. Callos y Guatitas faces several challenges, the first of which is to achieve maximum exposure. The greater the number of stations carrying it in both countries, the easier it will be to disseminate new ideas. At the same time, increasing the opportunities for listening via the Internet in areas where it is not available by radio and even in other countries where similar immigration patterns are beginning to develop - increasing numbers of Ecuadorians are arriving in Italy, for instance - is a means of expansion that has not yet been fully exploited. The second challenge is to include the other areas of the programme in the communication strategy. One example of this that is being tried involves broadcasting information from the research on how money is sent from Spain to Ecuador. The research provided detailed information on the ways in which money is sent and on costs and commissions. Over the coming months Callos y Guatitas will disseminate this information, introducing more competition into the market, reducing prices and helping prevent the current forms of abuse. José Tonello, director of the Fondo Ecuatoriano Populorum Progressio, says that fifty years ago many people emigrated from his native region in northern Italy, one of the country's poorest. As a result of that emigration, this area is now rich and prosperous. His perspective is also that of the Ecuador-Spain Migration, Communication, and Development Program. In this context, the Callos y Guatitas radio programme is a contribution to the ways in which popular and community radio stations are interpreting both new technologies and their own roles in society. The 10% estimate is based on a strict linguistic criteria - 12 million people speak an indigenous language. When less strict criteria are applied, estimates of the number indigenous people rises to as much as 30% of the total population. Ejercito Zapatista de Liberación Nacional - Zapatisa National Liberation Army. Significant changes have been witnessed over periods of several years. Some of these are related to the positions of the "ethnicists," who promote an ideal view of cultural redemption and conservation. Other more avant-garde positions are aimed at having a positive impact on the reinforcement and development of ethnicity so as to contribute to the emancipation of indigenous peoples and to shape a project for indigenous autonomy within the framework of the nation-state. Cornejo, I (1990). La Voz de la Mixteca y la comunidad receptora de la Mixteca Oaxaqueña. Universidad Iberoamericana. Master's thesis. Vargas, L. (1995). Social Uses and Participatory Practices: The Use of Participatory Radio by Ethnic Minorities in Mexico. Boulder, Colorado, USA: Westview Press. Bezaury, J. and Valenzuela, V. (1982). Presencia de la Voz de la Montaña en las comunidades. INI. Unpublished research, page 40. Callos y Guatitas is the name of the radio programme that is discussed in this chapter. The name comes from a dish made of tripe that is popular in both countries and referred to as callos in Spain and guatitas in Ecuador. Sixto Durán, Abdalá Bucaram, Rosalía Arteaga, Fabián Alarcón, Jamil Mahuad, the military indigenous triumvirate, Gustavo Noboa each had a turn as head of state, with mandates lasting as little as a day. Fondo Ecuatoriano Populorum Progressio, one of the agencies participating in the Migration, Communication and Development program.